especially in Oracle during the Fire season? BURN PERMITS: Backyard burning usually requires a permit. Contact Pinal County Air Quality Control for more information on burns in our area. 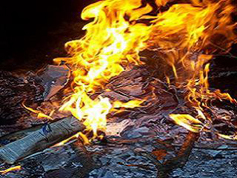 Certain types of fires may be exempt from burning permits. Exempt fires may include: heating fires, cooking fires, and recreation fires, however these fires need to be kept small and under control at all times. The Arizona State Land department and the Coronado National Forest have their own rules and burning restrictions. It's best to check directly with those agencies before burning, or even smoking on public lands. WOOD BURNING – EPA has a video that offers easy steps the public can take to help protect their health and save money when burning wood. This video provides steps on how to test dry wood for proper use in wood stoves or fireplaces. During the winter, residential wood smoke can be a significant source of fine particulate matter (PM2.5). The pollutant can trigger asthma, aggravate other lung diseases such as chronic obstructive pulmonary disease (COPD) and aggravate heart disease. Click HERE to see this 2-minute video recommended by Pinal County. This video can also be seen on the Pinal County Air Quality Burn web page. • Dress appropriately. Wear closed toe shoes and cotton clothing. Also wear leather or cotton gloves, eye protection and a hat. • A few small fires are usually safer than one large fire. Begin with a small fire and feed that fire by using fuels from a nearby pile. • Fire fighting tools (shovel, rake, charged water hose) must be near and available at all times. • Be aware of burning under power lines, phone lines and low branches. Aluminum power lines can melt at low temperatures. • Do not burn at the base of a hill or on any slopes. • Have a flat non-combustible 20 foot perimeter around the fire and wet down the surrounding area as often necessary. • Never leave the fire unattended. Extinguish before nightfall. • Be courteous of your neighbors. The smell of smoke can alarm many people and they will call 911 to report it. Alert as many of your neighbors as possible before you start to burn. • Before you begin burning, call the Oracle Fire Dept. at 896-2980 to advise the on-duty crew of the location and the approximate hours that you intend to burn. • You are legally responsible for your fire. If your fire escapes you can be held personally liable for damages. • Be very cautious of flying embers from even a small breeze. • Please follow all of the rules listed on the front of your burn permit. If your fire should get out of control, quickly call 911.